This is the fifth annual Enid Mark Lecture on Contemporary Book Arts & Poetry, in honor of the memory of artist, writer, and fine book publisher Enid Mark, class of 1954. Sponsored by the Mortimer Rare Book Room. 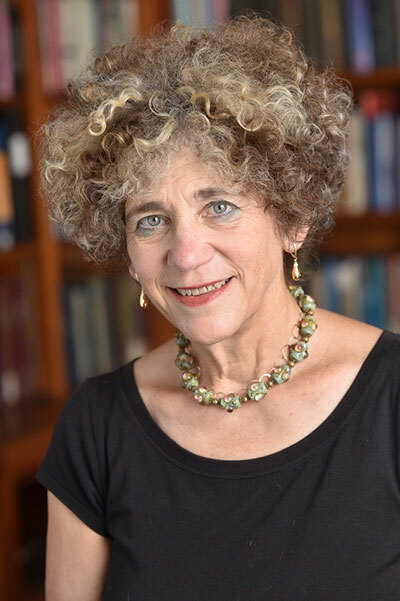 Book artist, poet, theorist, teacher, and designer Johanna Drucker will present "Alphabet Histories: From Ancient Sources to Global Infrastructure" at 6:30 p.m. on Thursday, April 18th in the Weinstein Auditorium. A reception will follow in the Wright Hall lobby and Poetry Center at 8 p.m. Drucker is the 2019 Enid Mark Lecture speaker; the lecture features a different speaker every year and is presented by the Mortimer Rare Book Collection, a part of Smith College Libraries' Special Collections. One of the longest-lasting technologies of knowledge production, the alphabet continues to play a major role in global information infrastructure. The very concept of “the alphabet” and its origins shift as sources broaden from texts of 5th-century BCE Greek historian Herodotus, to medieval compendia, antiquarian studies, archaeological methods, paleographic techniques, and digital analysis. These knowledge technologies inform how the materiality of sources plays a role in historical understanding. Drucker is the Breslauer Professor of Bibliographical Studies in the Department of Information Studies at University of California, Los Angeles. She is internationally known for her work in artists’ books, the history of graphic design, typography, experimental poetry, fine art, and digital humanities. Her work is represented in special collections in museums and libraries in North America and Europe. Her recent titles include Downdrift: An EcoFiction and The General Theory of Social Relativity, both published in 2018. She is currently the Inaugural Beinecke Fellow in Material Cultures at Yale University. Enid Mark ‘54 was passionate about words and imagery. From the 1980s until shortly before her death in 2008, Enid carefully considered all components of her books: text (her own words or those written by others, many of them modern women poets); imagery (her own artwork); type design and layout; binding. In creating her books she collaborated with a small group of New England artists, including bookbinders Barbara Blumenthal and Sarah Creighton, and printers Dan Keleher and Art Larson. Timothy Sheesley printed the illustrations in most of her books. Enid attended the High School of Music & Art in Manhattan, then studied English literature and studio art at Smith College. She pursued painting and printmaking in the early years of her career and came to favor the technique of photolithography. In 1986, she founded the ELM Press. Her work is included in more than 100 private and public collections in the United States, Canada, England, and Israel. Enid received a 2006 Fellowship from the Pennsylvania Council on the Arts in recognition for her work in book arts. Among her other honors are a Pew Fellowship in the Arts and the Leeway Foundation Award for Achievement. In 2004, her book The Elements was awarded the 9th Biennial Carl Hertzog Award for Excellence in Book Design from the University of Texas/El Paso. Assisted listening devices for Weinstein Auditorium are available by request. Please email Nichole Calero at ncalero@smith.edu. For other disability accommodations, please contact the Office of Disability Services at least 10 days prior to the event at ods@smith.edu.